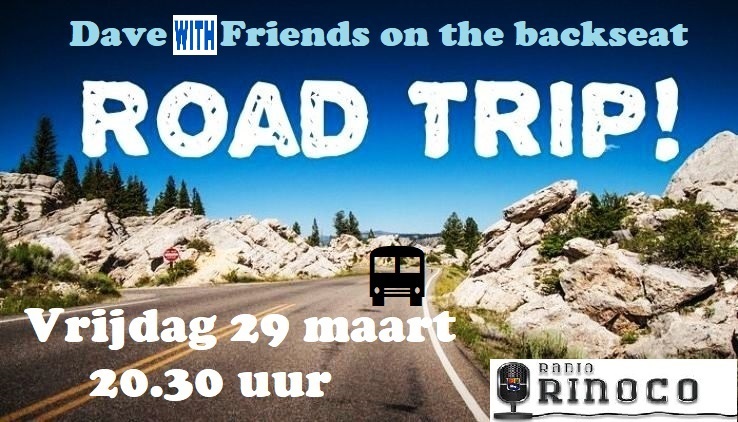 Vrijdag 29 maart: The Road Trip! Re: Vrijdag 29 maart: The Road Trip! Komend weekend is er weer volop activiteit vanuit Studio Ezinge! Twee dagen lang maken 4 DJ's de stream onveilig! Elke DJ heeft 15 plaatjes geselecteerd en dat zorgt voor veel verschillende muziekjes. Natuurlijk is er ook ruimte voor verzoekjes! "Jonathan Jeremiah"	"If You Only"
"Ben Mazu�"	"La femme id�ale"
"David Bowie"	"Let's Spend the Night Together"
"The Raconteurs"	"Now That You're Gone"
"Marzattack"	"Byron Bay [feat Luca Sestak]"
"Moody Blues"	"Ride My See-Saw"
"Dermot Kennedy"	"Power Over Me"
"The Rah Band"	"Clouds Across The Moon (Single Version)"
"Poets of the Fall"	"Rebirth"
"Christine and the Queens"	"Paradis Perdus"
"SYLVESTER"	"YOU MAKE ME FEEL (MIGHTY REAL)"
"Fellini F�lin"	"On the Way Home (Radio Edit)"
"Talk Talk"	"Ren�e [live at Montreux 1986]"
"Status Quo"	"Whatever You Want"
"Capital Cities"	"Safe And Sound"
"Blue Man Group"	"Time To Start"
"Steppenwolf"	"Born To Be Wild"
"Editors"	"Barricades [the Blanck Mass recording]"
"1975"	"Love It If We Made It (Album Version)"
"UNKLE"	"On My Knees (feat. Michael Kiwanuka)"
"Queen"	"I'm In Love With My Car"
"Dodie"	"Sick of Losing Soulmates"
"Gerry & The Pacemakers"	"Ferry Cross The Mersey"
"Bryan Ferry and Roxy Music"	"Don't Stop The Dance"
"The Small Faces"	"Itchycoo Park"
"the animals"	"We've Gotta Get Out Of This Place"
"RPWL"	"Roses (feat. Ray Wilson)"
"Tremeloes"	"Even the bad times are good"
"The Walker Brothers"	"No Regrets"
"Traffic"	"John Barleycorn Must Die"
"Various Artists"	"Reflections Of My Life - Marme"
"Tony Joe White"	"Ice Cream Man"
"John Mayer with Keith Urban"	"Don't Let Me Down"
"King Gizzard & The Lizard Wizard"	"Rattlesnake"
"Roger Waters"	"It's A Miracle"
"Jericho Jones"	"Man In The Crowd"
"Chicken Bones"	"Return To The Past (Bonus)"
"The Rolling Stones"	"Brown Sugar"
"The Who"	"Who Are You"
"Python Lee Jackson"	"In A Broken Dream"
"Queen"	"The Night Comes Down"